I slept like a rock last night – it ended up raining a bit, and the room actually got a little cool – I was happy to find an extra blanket because there was one little window sort of thing I couldn’t close all the way. I gathered up some food and stuff for the day and headed back to the national park. 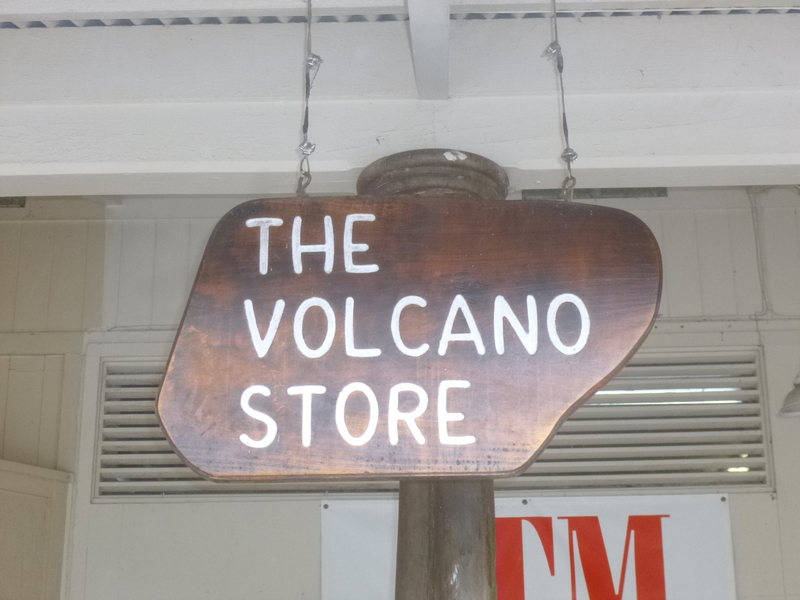 Along the way, I stopped at the general store in Volcano Village because I wanted to get some more water. There’s a few small villages in this area, otherwise it’s pretty undeveloped. It’s pretty to drive through although there’s quite an elevation change along the way. I think the hostel was at about 1000 feet – maybe 1500 – and the national park is about 4000 feet. Most of it is just a gradual long hill. The general store had a banner tied to their front porch that said something about ‘Hula at the Volcano’ with today’s date, starting shortly. I wasn’t sure what it was, but scurried along to the national park to find out. I parked at the visitor center and went in to ask where to go. They directed me to another building, and they in turn directed me to an outdoor grass stage where something was just beginning. 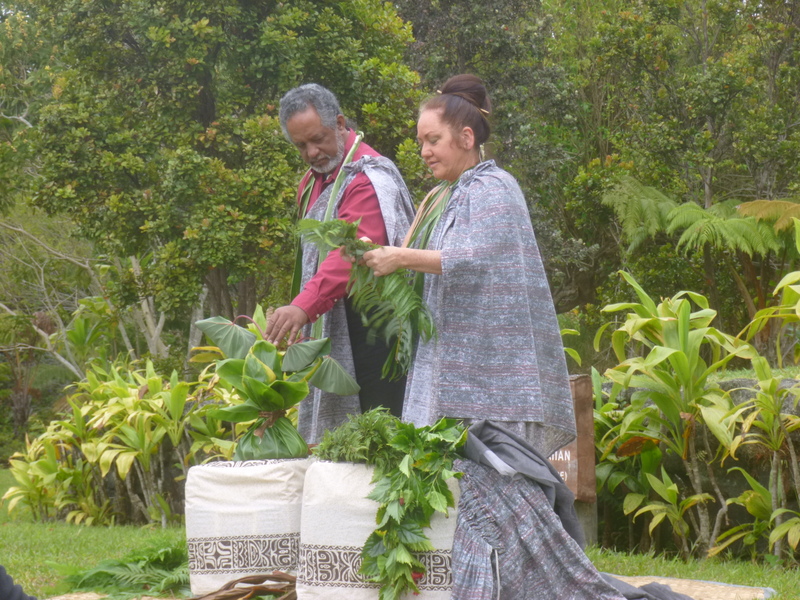 It turned out to be the beginning of an amazing story and dance – an older married Hawaiian couple were going to demonstrate the makings of the traditional head, arm and ankle accessories for dancers, and they were also going to make and wrap a traditional offering to Pele, the goddess of the volcanoes – all out of natural things they find in the forest. Then they were going to perform the hula of the forest. 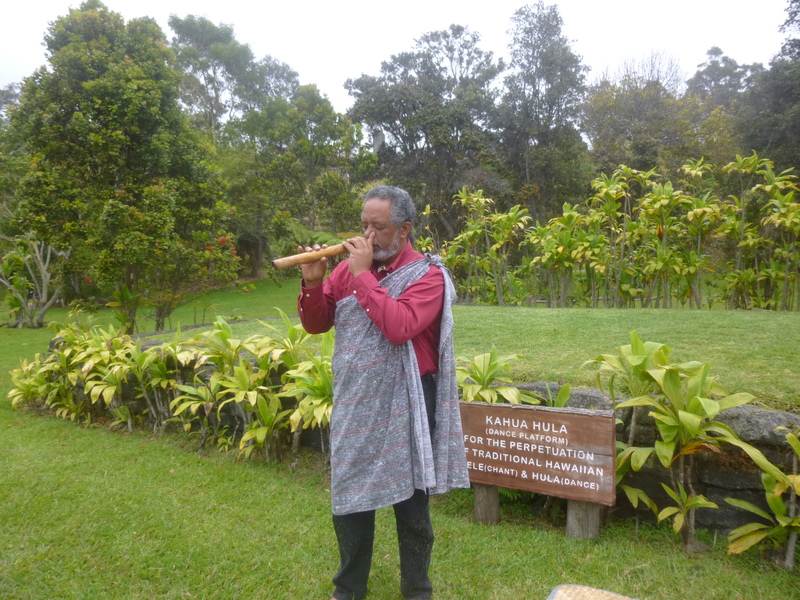 The husband played a beautiful flute that he made out of bamboo, and some drums and did some of the narrating. The wife made the accessories, wrapped the gift and danced. The accessories were made of big leaves and vines that could be braided and twisted to the correct dimensions. The braided vines are so strong they can pull 2 adults to their feet without coming close to breaking. I missed just a little part of this because I ran back to the car for my camera – I hadn’t thought to grab my stuff when I originally went into the visitors center. 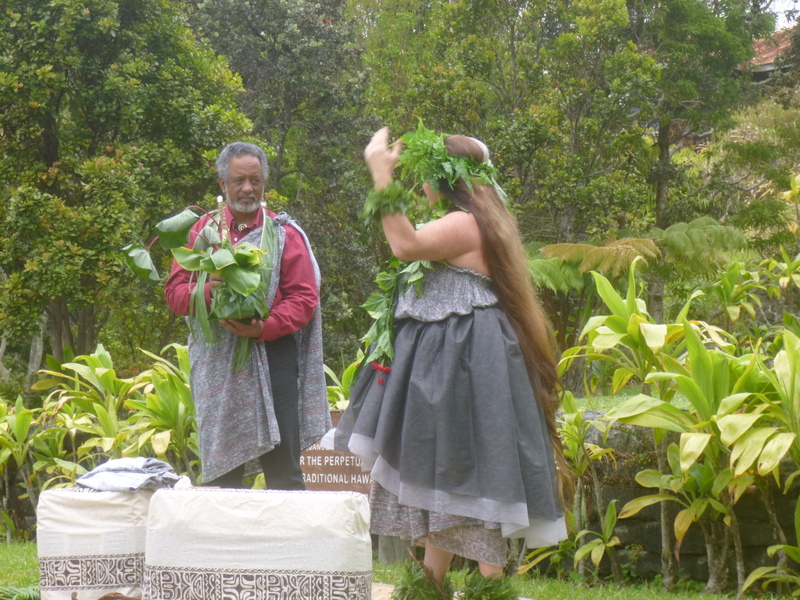 The making and offering of Pele’s gift was fascinating, and taken very seriously. The grass stage faces the volcano. The offering for this occasion was salt. Salt is a cleansing agent, and is also used for preservation, and in this case, it represented the preservation of local lore and knowledge and ties to the earth. The lady told me afterward that salt is always a good gift, because of the symbolism, if you don’t know what else to offer. She poured the salt out of a small wooden bowl onto a leaf, and proceeded to wrap up the leaf like a little envelope. That was the offering, but it had to be wrapped. They started with a thick vine that had about 8 leaves hanging from it. The long green leaves were spread out and the salt envelope was placed in the middle and alternating leaves were pulled up until they were all held in one hand at the top of the package. Before the gift was tied shut with a braided vine, another sprinkle of salt was added for good measure, and then the gift was decorated with a green leaf braided “ribbon” with a red flower (hibiscus) at each end of the ribbon, adding just a small bit of color. The offering was then set in a corner of the stage in preparation for the chanting and dance that would accompany the offering. The lady tied on a new skirt she had just made, in colors of gray that she thought would be pleasing to Pele, representing the colors of the smoke. There’s a precise process to putting on the skirt, and seems like one would need about 4 hands. Then she put on all the green accessories, and took out the chopstick that was holding her hair in its bun, and her hair fell down nearly to her ankles! We learned a little bit about the history of the hula, which was originally performed by men, and had its origins in some if the martial arts movements. The 2 grandfather hulas are the Hula of the Temple, and I simply can’t remember the second one. 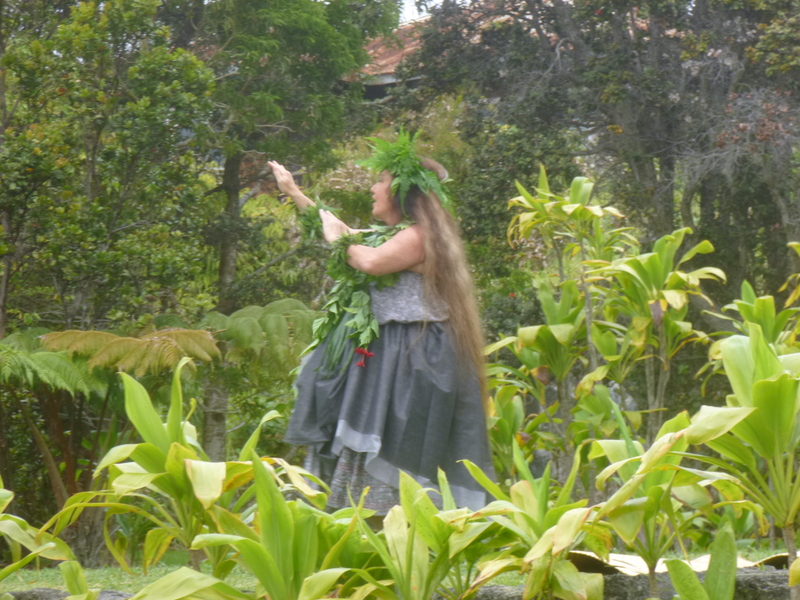 The 2 grandmother hulas are the Hula of the Common People and the Hula of the Forest. Then the story and the chanting and the dance began, describing the connections between man and earth and nature. I thought it was beautiful. Afterward, all accessories were removed, and placed in the corner next to the offering. And there it would remain, hopefully untouched, until it begins to decay a bit, and then the park rangers remove it to a special place. They were happy to talk to people afterward, and I eventually went up to let them know how much I enjoyed the morning, and to see about making a donation to their dance school (she says if girls don’t grow up with the hula and history in their households, it could take 20 years for a non-Hawaiian to learn and earn the rights to wear all the accessories and perform all the traditional historical dances.) 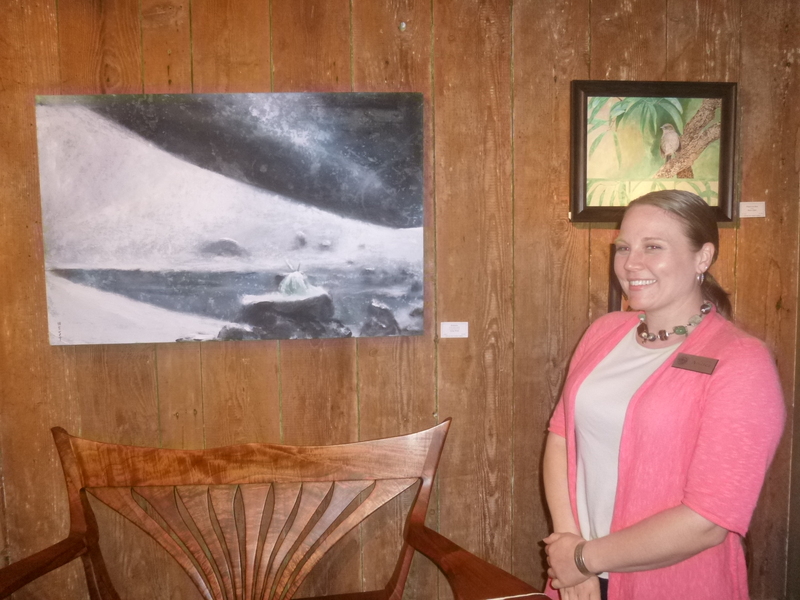 She suggested I make the donation to the Volcano Art Center, which had arranged for them to come out, and said the art center offers a lot of different programs. 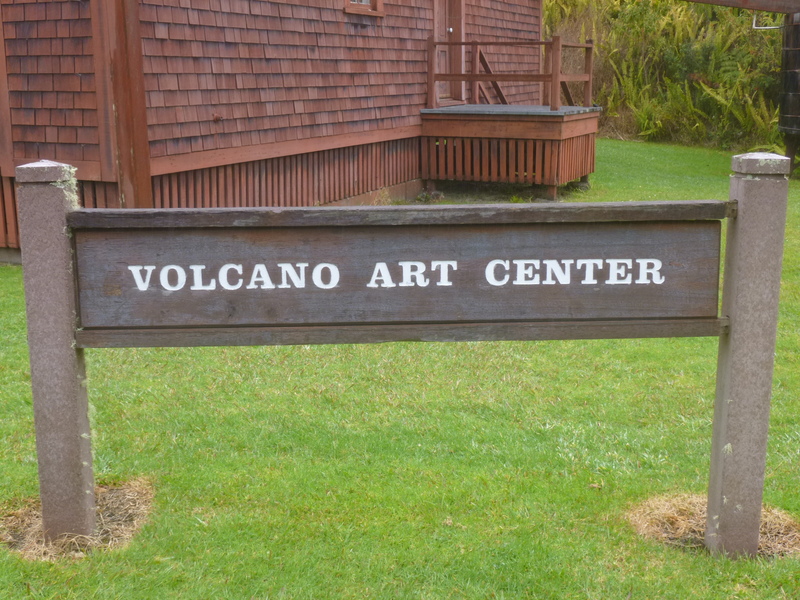 The Volcano Art Center was next to the visitor center, so I went in there and met one of the young ladies, who was so wonderfully enthusiastic and supportive of my journey. It was fun to talk with her. She showed me around a bit – the building used to be part of the Volcano Motel, but has undergone numerous changes from when it was first built. There was some nice artwork in there. I was happy with the donation – I knew I wanted to do something volcano-related and this was a fun one. When I was done at the Volcano Art Center, I headed over to the visitor center to get some hiking info. And there was a group of hikers getting ready to leave on a ranger-led hike to the caldera floor. I managed to dash back to the car to get my walking shoes on and grab the camera and water and was back before they left. It was an awesome hike, and I learned so much about some of the vines and ferns and trees in the rainforest. 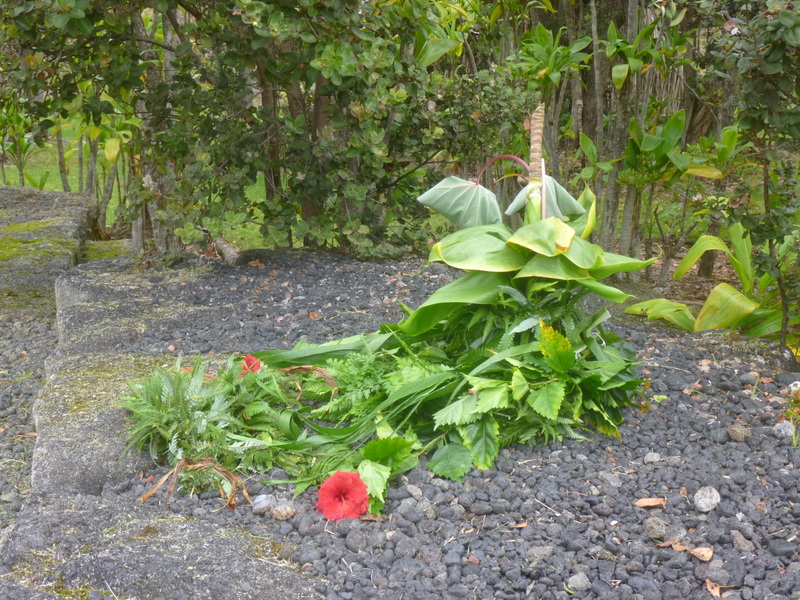 The volcanic soil isn’t conducive to many of the trees and plants, so there are ferns that get to be 6-8 feet tall and then they fall down and been to decay and become “nurseries” for other plants, eventually providing a rich soil for them. And then the fern magically begins to re-grow itself about 6 feet away from where it fell down. Pretty amazing. Then we came to a steep part of the trail and ended up descending about 400 feet to the floor of the volcano. 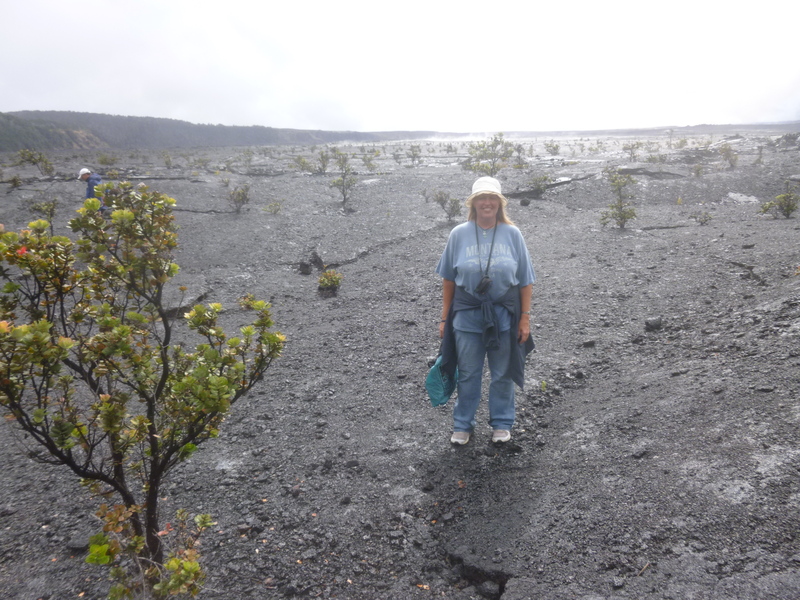 It was like being in another planet – all flat, black, cracked lava. There are some tiny, fine fibers that formed when the lava was cooling, and it’s called Pele’s hair, and it looks like hair but it can be broken. The caldera was about 2 miles wide and 3 miles long, and of course we could not go at all near the actual crater. The rangers all carry gas meters that can detect even minute amounts of harmful gases, and the readings today were zero, although it is a constantly changing situation. There are scientific instruments at many locations throughout the park to detect temperatures, gas levels and even the tiniest bit of bulging in the ground that could indicate potential harmful activity – these volcanoes are heavily monitored, but it’s done unobtrusively. We had about 20 minutes to wander around down there, and then we began the steep climb out and started back toward the visitor center. Once we were back on flat land, we were free to leave the group if there were other hikes we wanted to do. 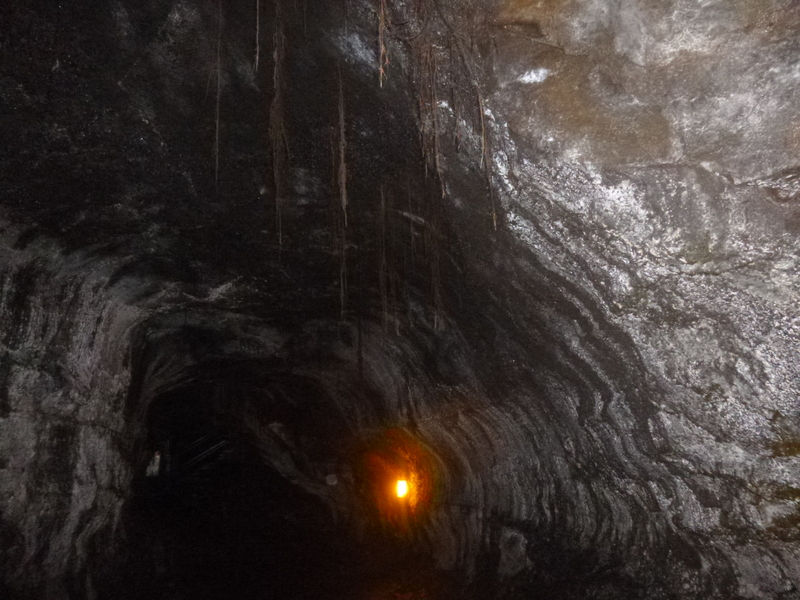 I figured I had just about enough time to do the 4 1/2 mile round trip hike to the Thurston Lava Tube. People can drive down to a closer parking lot, but I wanted to walk. 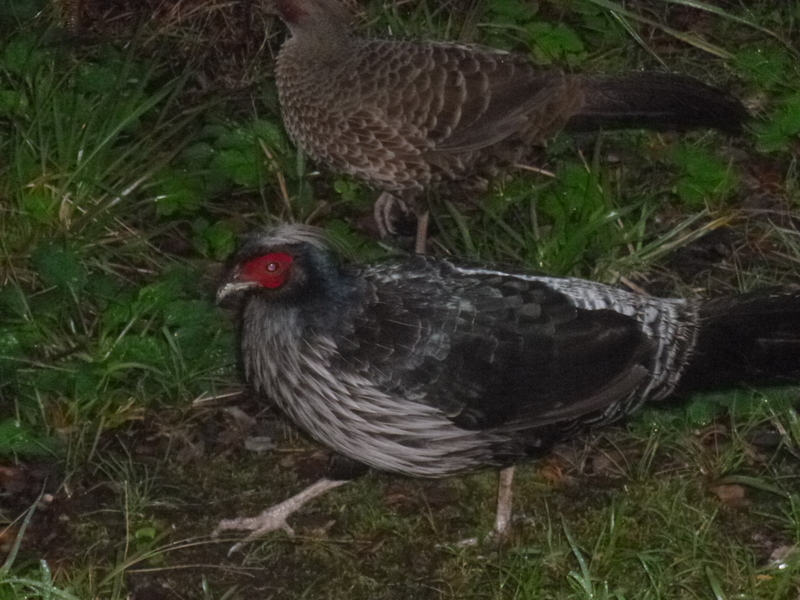 I enjoyed that hike too, and saw lots of birds that kind of looked like chickens with a red mask. 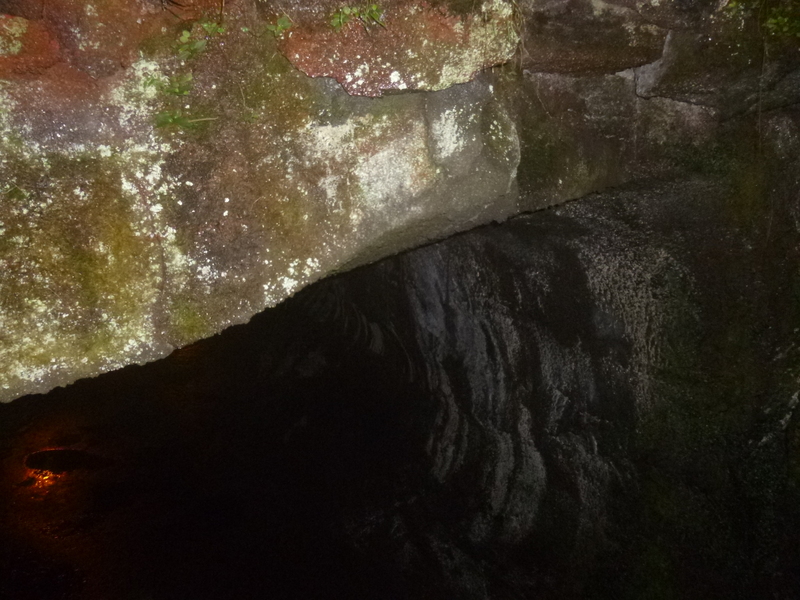 The lava tube was created during an eruption – the surface lava would cool relatively quickly, but rivers of lava would continue to flow underneath, creating little “tunnels” of lava. When the lava stops flowing, the tubes empty out, leaving just the shell of the outer tube, and that’s what I was able to walk through. It wasn’t very crowded this time of day. 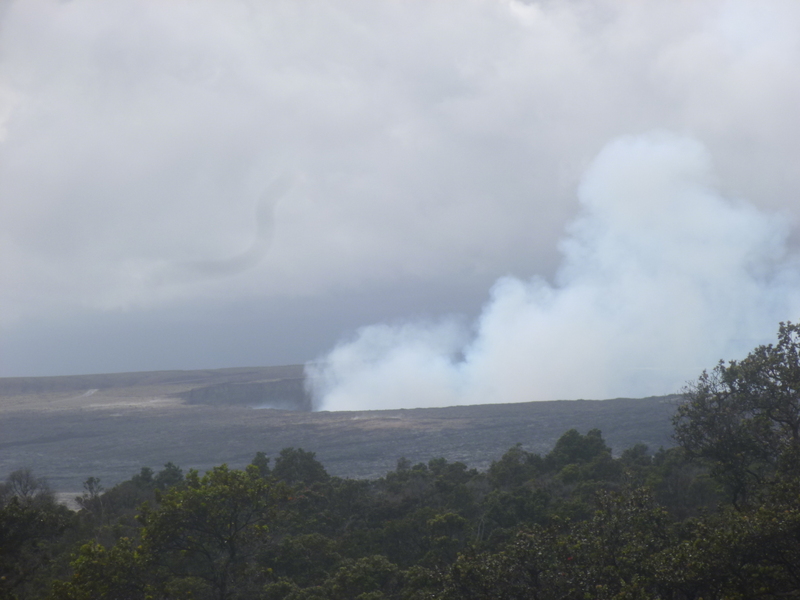 I walked back to the visitor center, then decided to head out of the park to drive about 45 miles to where the road ends (blocked by lava) at a place where people can walk out across a lava field to see the lava flowing into the ocean, depending on weather conditions. 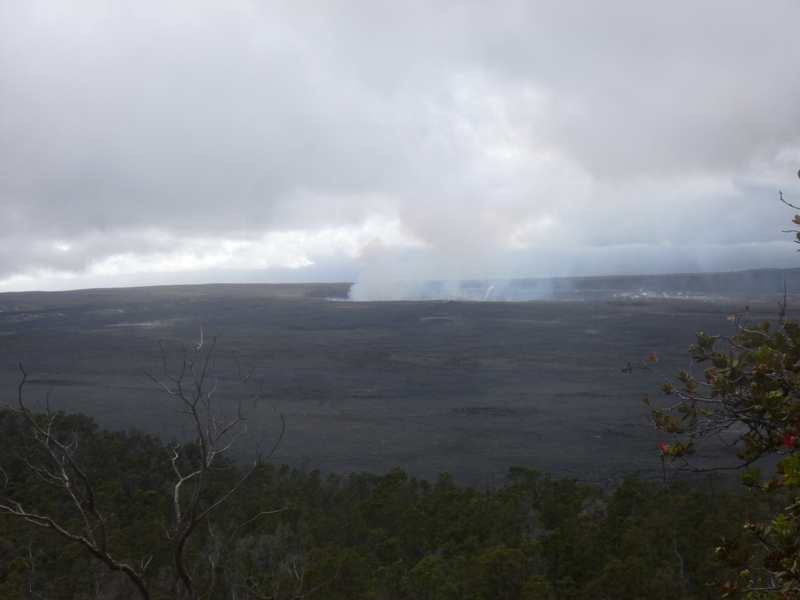 By day apparently you can see steam; by night you can see the red hot colors of the lava flowing. I had heard they don’t allow any more cars in after 8, and I got there just in time. My information on this place was a bit iffy, and it was only briefly mentioned on national park brochures because it is off NPS property. 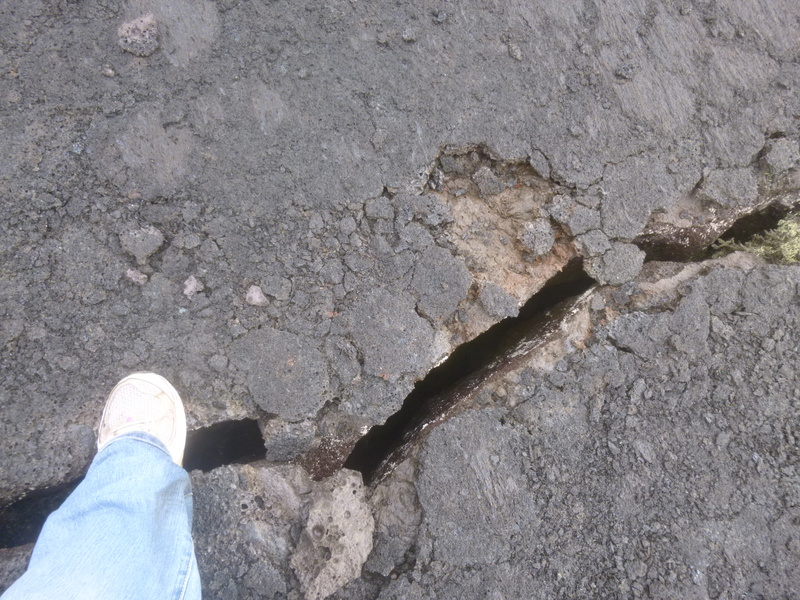 I walked along the road to where the most recent eruption had blocked the road. I started walking out on the lava field by the light of the full moon, but there was no clear evidence of a path (and there was a good mile or 2 to walk). There were people around, going out just about as far as I did, and there were other people coming back from the end of the trail with different reports about what they saw. The lava stretched as far as I could see – it hasn’t been that many years since the last eruption, and the lava spared some houses, and destroyed some others. It looks like it had been a neighborhood of very nice homes for a time. 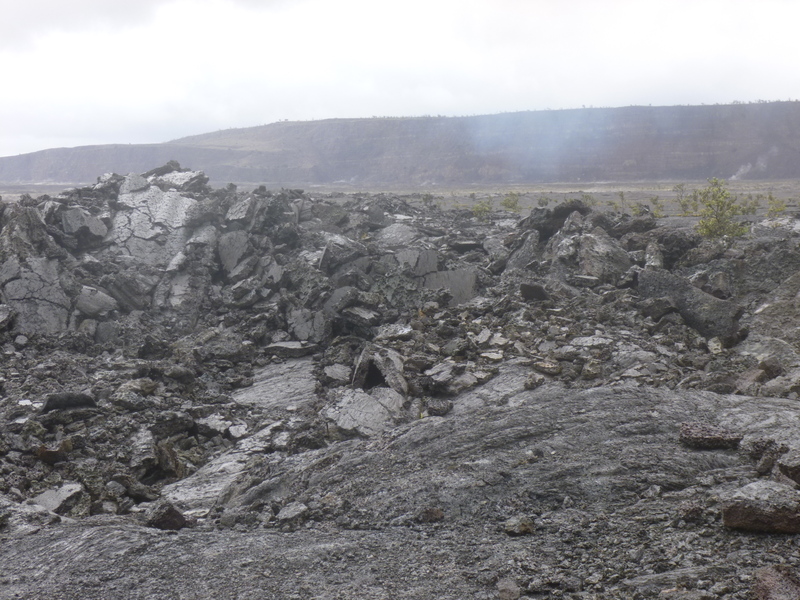 For a few minutes, I was the only one standing on the lava field, surrounded be a sea of lava and the full moon, and behind me the shell of a destroyed house. It was kind of surreal. 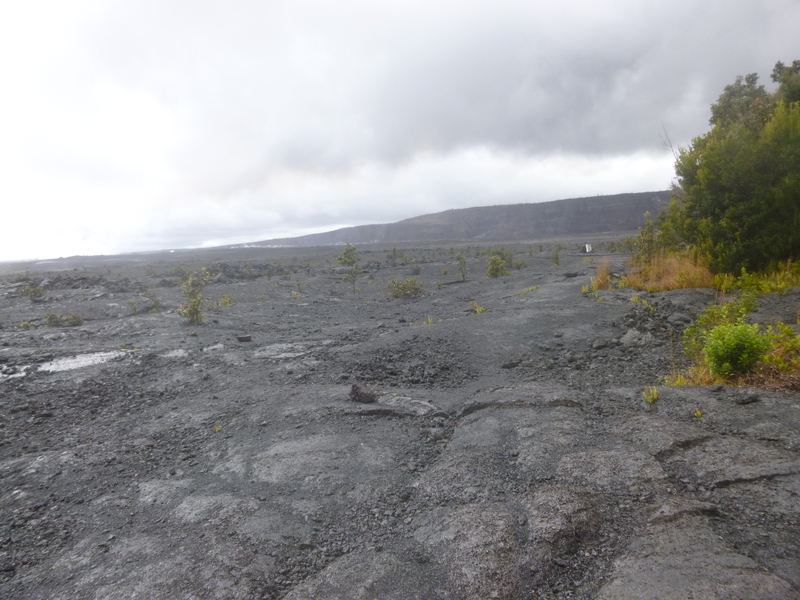 The lava was difficult to walk on – very uneven and chunky, and even if there was a clearly marked trail, I wouldn’t have attempted the walk without a really good light. Some people headed out with weak flashlights and I wondered how far they would get. Once I had my fill of lava in moonlight, it was time to head back to the hostel. Even though I’m the only one staying there, the manager left a lot of welcoming lights on. A pleasant end to a good day.